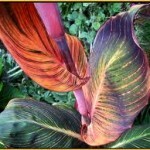 I was given several canna lily rhizomes by a neighbor a few years back. They were long and knobby, pale as parsnips, caked with dirt and dangling hairy roots. “They’re beautiful when they start to grow,” my neighbor assured me. “And they get really tall, though mine have yet to flower.” Great, I thought. Plants that don’t flower. Just what every garden needs. 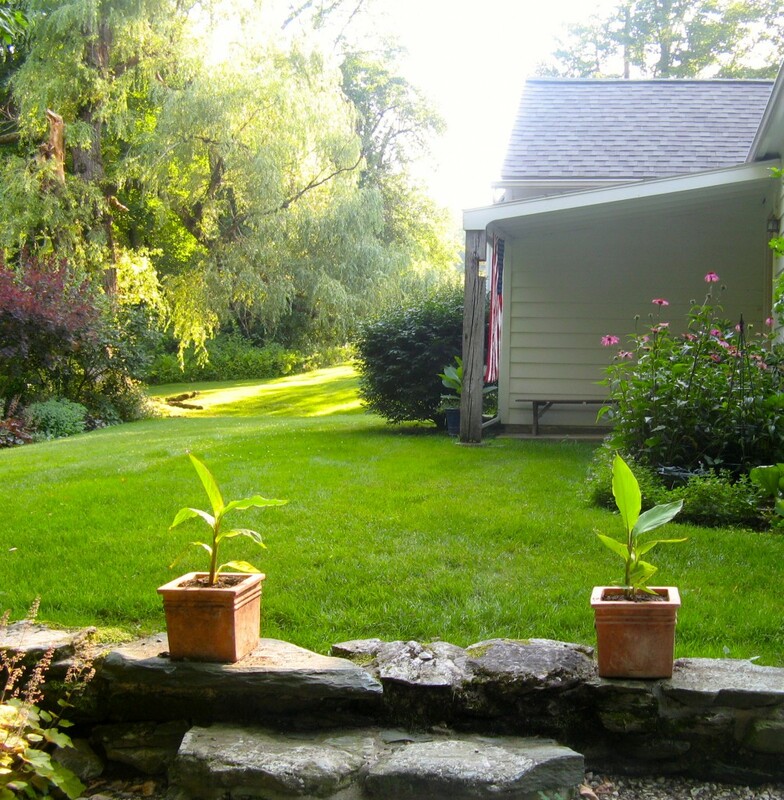 I waited until the overnight temperatures stayed above freezing, as my neighbor had advised, then I dug a hole in the back of my long border and arranged the cannas inside. They looked like the bones of some small animal curled up in a shallow grave. I covered the whole sad business over with dirt thinking that would probably be the last I’d see of them. 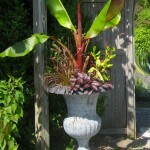 Cannas aren’t technically lilies. 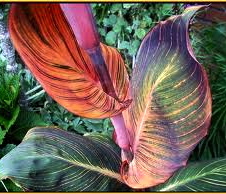 They’re related to the ginger family and form a genus all their own (Canna) which includes over 20 different species. With their flamboyant colors, showy contours, and often towering size, they’re considered tropical, but in fact they flourish in our area when exposed to at least six hours of sun. Like dahlias, though, they must be dug up in the fall, moved inside, and bedded down between layers of peat moss. However, you’ll discover a bonus at the end of the season when you lift them for storage: the plant will have produced a number of new rhizomes just like the one you started with. 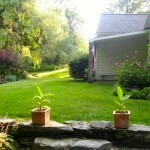 The cannas I planted did grow, after all. And grow. Though what they actually did was unfurl upwards, sheaf shooting up through sheaf, in a kind of slow-motion fountain of flowering. By the end of the summer, they were the size of small shrubs. Their striated leaves were various shades of deep green and ruby red, enticingly fanned, like so many can-can dancers in mid-kick. Though they didn’t, in fact, flower. But by then it hardly mattered. 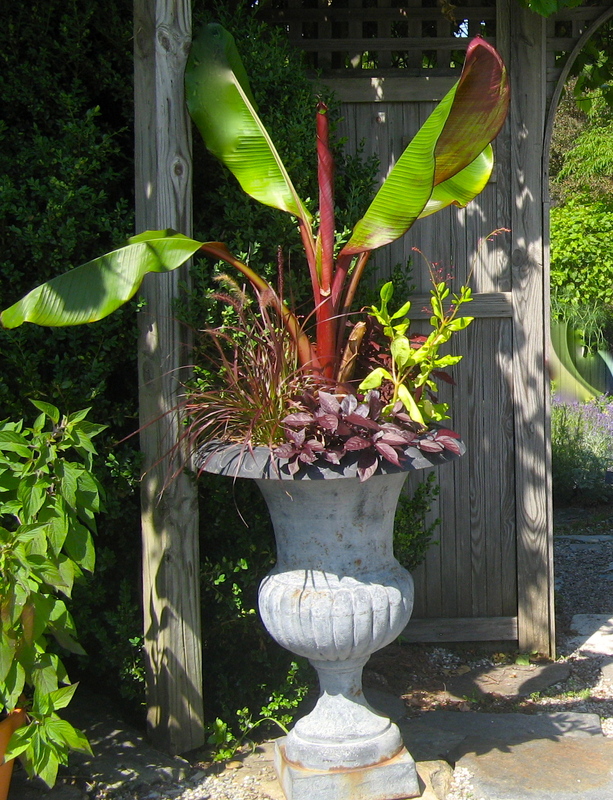 They added such drama and structure to the back of the border that I vowed that the following summer I’d find a much more visible place for them in the garden. But where? Their exotic, come-hither glamour would make my sedate and traditional border of sedums, hydrangeas, and phlox seem almost dowdy in comparison. And their ripe, tropical colors didn’t fit in with my well-behaved palate of mauves, white, pinks, and blues. Don’t “they” look great in their welcoming location ! That’s actually a photo from early last summer. We still have some snow on the ground (though mostly just patches) in these parts. I do hope it will be melted by your return at the end of June! Definitely good idea using the pots. Even with our brief cold spell during our Jacksonville winters, I pot the ones that will need to stay inside. Very cool article, Liza! Thanks, Carole! I always love to hear what’s happening in gardens in other parts of the country. Please keep me posted!